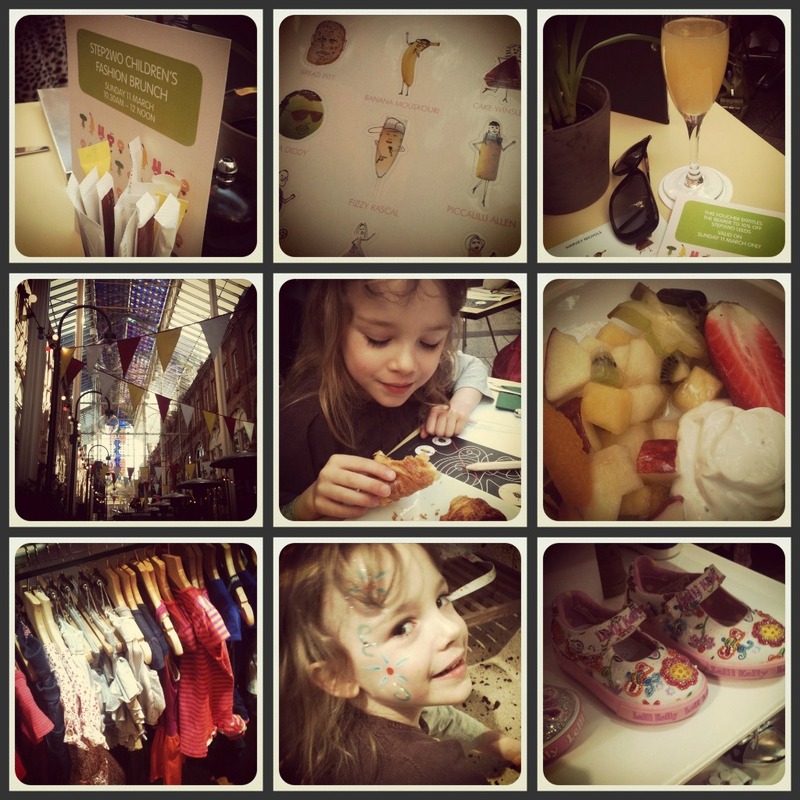 I spent a lovely morning with my daughter yesterday having brunch and watching a children’s fashion show at Harvey Nichols in Leeds. Like many girls of her age, Eve has got very firm views about what she likes to wear. Now that she’s spending so much of her time dressed in a school uniform, I like to indulge her a bit when she isn’t at school, even if that means letting her wear an outfit containing all the colours of the rainbow. After all, if you can’t dress like that when you’re five, when can you? Actually, with her colour blocking and clashing prints, I’d go as far as saying that she’s got the measure of recent seasons far more than I have. We arrived to the event and were shown to our seats in the lovely bunting-filled Espresso Bar in the Victoria Quarter. After being presented with a superb little colouring-in kit, we also were very happy to receive juice, fresh pastries and a sunny fruit salad with accompanying vanilla yoghurt. Perfect food for an easy Sunday brunch. Ooh, and I had a Bellini too, which made me very happy. Before I go any further, I have to mention the stickers in Eve’s kit. To be honest, they’re wasted on children because they are the best stickers ever! Famous characters of our age are recreated as items of food. So, we have Paris Stilton, Gordon Brownie, and Wayne Pruney…just brilliant. I would have sneaked them away for my own use, but Eve recognised their brilliance too and so they’re now all adorning her favourite notebook. I suppose my lack of stickers gives us a nice excuse to return to the Espresso Bar for brunch another day though, because I really need a Banana Mouskouri sticker of my own. Anyway, onto the fashion show itself, which was a great showcasing of the Spring and Summer collections available from the ‘Step 2wo’ concession inside the Harvey Nichols Leeds store. A wonderful group of young models, including a gorgeous little three year old boy who received a round of applause every time he emerged, did a great job. Eve thoroughly enjoyed watching them all, and telling me which things she liked the best. By the end of the show, we had a great long wish list between us. Eve particularly loved the denim dress by No Added Sugar, which had great gold-edged ruffles on the bottom. We have a few pieces from this brand already, and I love them all. They have a great quirkiness to them, far removed from the pale pink princess clothing that is often created for girls. The colours are bolder, the shapes are often unusual, with ruffles, asymmetry and draping and, important from a practical point of view, they are really good quality, so they wash and wear well. There is a good selection of items from this range for both boys and girls instore. Many of the brands represented instore were included in the show, such as Gucci and Versace, although my other favourite pieces were the Paul Smith t-shirt and stripy boy’s shirt, which Ben would look very cool in. I also adored the Stella McCartney citrus print mac (the same print as the adult line for the current season) and green Hunter wellies over a cream dress, which would be perfect junior festival chic! Inside the store, we spent some time choosing our favourite Lelli Kelly sequinned shoes and Converse high tops. We’re going back for a pink pair of those. I live in my Converse, so I think it’s only fitting that I share the love. I have a feeling that the denim No Added Sugar dress will be coming home with us as well. We had such a great time. It was the first time we have ever really been out for a ‘girly’ time together and I enjoyed it so much. She’s growing up so fast, one day, she’ll be poring over the MAC counter in Harvey Nichols as much as I do. This time, though, it was all about the glittery flower face painting. A nice addition to a lovely event. With many, many thanks to Harvey Nichols for the invitation. Sounds like an amazing day! I love nothing better than girly time with my daugter which usually revolves around food or book shopping!